Over Easter, I was asked to prepare a simple (and egg-free) dessert for next day's brunch. 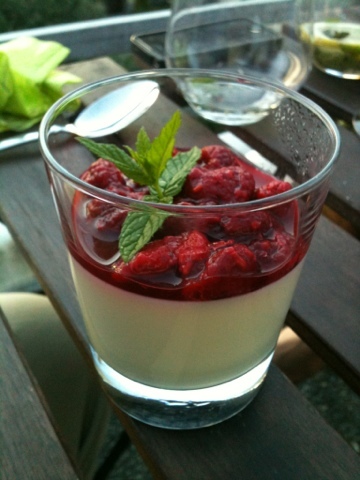 Since the sun was out for the first time this Spring in Sweden, I thought I should make a more "summery" dessert and opted for a panna cotta, which is absolutely delicious! Panna cotta, literally meaning cooked cream, is an Italian dessert composed of cooked cream with vanilla and sugar (and some gelatin for the consistency). You can have it plain, or with fresh berries, or berry compote or sauce. 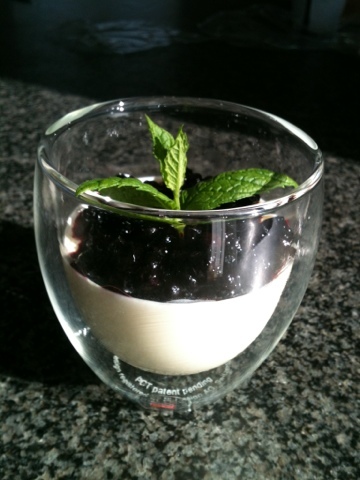 Panna cotta is especially good with blueberries and raspberries, fresh or as a sauce. The recipe is easy to follow and the ingredients are relatively cheap. It takes however about an hour to prepare, and a few more hours to cool down and refrigerate, so I suggest preparing panna cotta the night before or early in the morning. Put the gelatin sheets in a bowl with cold water. Put the cream, milk, sugar, vanilla seeds and pod in a saucepan. Heat up the mix slowly until it boils (this takes 30-40 min), then turn off the heat and take the gelatin out of the water. Add the gelatin to the warm cream and mix gently while allowing the cream to cool down a bit. Pour the cream in small pots (4 pots of 1.5 dl, or more pots of smaller size). Let the cream cool down to room T, cover them and put them in the fridge for at least 3 hrs. Thaw the berries with some sugar and if you like some lemon. Once thawed, gently mix and put the berries with its coulis on top of every panna cotta and decorate with some mint leaves.